Background: Sibiraea angustata was used as folk medicine in Tibetan-inhabited area of Hengduan Mountains, China. Objective: The secondary metabolites from the leaves and twigs of S. angustata were studied. Materials and Methods: The compounds were isolated and purified using silica gel and Sephadex LH-20 column chromatography. Their structures were identified by spectra analysis. Results: Eight known compounds, including 2 monoterpenoids and 3 triterpenoids, were isolated and identified from S. angustata. Conclusions: Four compounds were isolated from this plant for the first time, and the 13C-nuclear magnetic resonance spectra data and absolute configuration of dihydroneroloxide were given for the first time. Abbreviations used: NMR: Nuclear magnetic resonance; TMS: Tetramethylsilane; ECD: Electronic circular dichroism; CC: Column chromatography; TLC: Thin-layer chromatography; DFT: Density functional theory; TDDFT: Time-dependent density functional theory; PCM: Polarizable continuum model. The absolute configuration of dihydroneroloxide was given by electronic circular dichroism calculation. Sibiraea angustata (Rehd.) Hand.-Mazz., a shrub from family Rosaceae, was mainly distributed in bush and gravel area of Hengduan Mountains, China, at an altitude of 3000–4000 m. Its leaves and twigs, called “Liucha,” were used as folk medicine by Tibetans to treat indigestion and upset stomach, and weight loss of livestock was also caused by this plant. Phytochemical studies on this plant revealed the presence of monoterpenoids and their glycosides, triterpenoids, phenolic acids, and fatty alcohols.,,,,,,, Previously, we also isolated one monoterpene lactone from S. angustata. In the current study, eight compounds [Figure 1], named oleanolic acid (1), ursolic acid (2), sibiscolacton (3), monopalmitin (4), (5S)-dihydroneroloxide (5), ferulic acid (6), alphitolic acid (7), and ethyl caffeate (8), were isolated from the leaves and swigs of S. angustata. Nuclear magnetic resonance (NMR) spectra were recorded on Varian Unity 400/54 and Bruker AV II-600 spectrometers with tetramethylsilane as an internal standard. 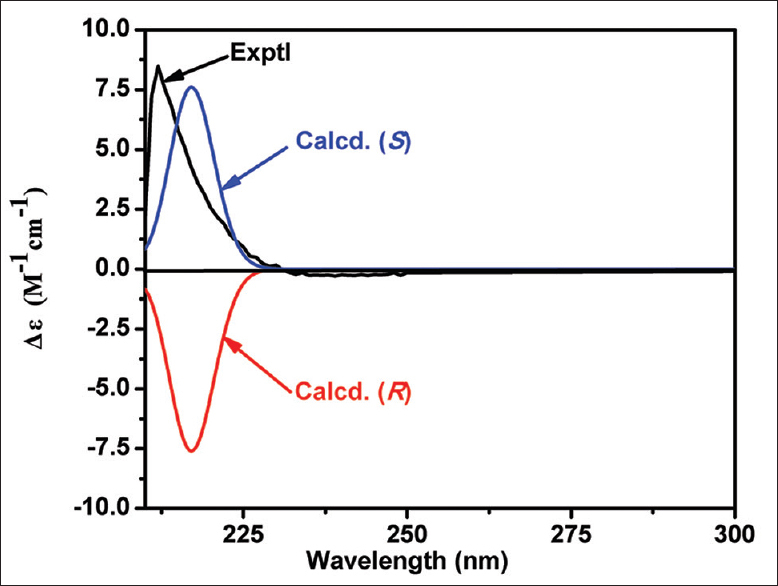 Electronic circular dichroism (ECD) spectra were obtained on Chirascan spectropolarimeter (Applied Photophysics). Optical rotation was measured on APVI/6W (Rudolph Research Analytical). Column chromatography (CC) was carried out using silica gel (Qingdao Marine Chemical Industry, 200–300 mesh) and Sephadex LH-20 (GE Healthcare). All the reagents and solvents used for separation and purification were analytical grade and purchased from local firms. The leaves and swigs of S. angustata were collected from Songpan County, Sichuan Province, China, in August 2008. The plant was identified by Prof. Tian-Zhi Wang, West China School of Pharmacy, Sichuan University. A voucher specimen (No. SA0808) was deposited in the Herbarium of West China School of Pharmacy, Sichuan University, Chengdu, China. The leaves and swigs of S. angustata (5 Kg) were powdered and extracted three times with 80% aq. EtOH under reflux. The solvents were evaporated in vacuo to yield ethanol extract, which was suspended in H2O and then extracted with EtOAc. The EtOAc extract (185 g) was subjected to CC over silica gel (200–300 mesh, 2 Kg) and eluted with a gradient solvent system (CHCl3-MeOH, 90:1-2:1) to give 12 fractions (Fr. 1-12). Fr. 2 (22 g) was isolated by silica gel chromatography eluted with solvent systems of cyclohexane-acetone (5:1) and preparative TLC (cyclohexane-acetone = 1.5:1) to afford mixture of compounds 1 and 2 (12 mg). Fr. 5 (4.5 g) was separated by silica gel chromatography (petroleum ether-acetone, 4.5:1) to give 10 subfractions (Fr. 5-1-5-10). Subfraction 5-8 (570 mg) was separated by silica gel chromatography (cyclohexane-acetone, 5:1; cyclohexane-EtOAc, 3:1) to give compound 3 (110 mg). Fr. 6 (2.6 g) was separated by silica gel chromatography (petroleum ether-acetone, 6:1-2:1) to give 8 subfractions (Fr. 6-1-6-8). Subfraction 6-3 (290 mg) was separated by silica gel chromatography (cyclohexane-EtOAc, 4:1; cyclohexane-acetone, 5:1) and purified on Sephadex LH-20 (CHCl3-MeOH, 2:1) to give compound 4 (12 mg). Fr. 7 (3 g) was isolated by silica gel chromatography (petroleum ether-acetone, 5.5:1-3:1 and cyclohexane-acetone, 4:1) and preparative TLC (cyclohexane-EtOAc, 1:1), then purified on Sephadex LH-20 (CHCl3-MeOH, 2:1) to give compound 5 (5 mg). Fr. 8 (2.6 g) yielded crystals (petroleum ether), and then, crystals were purified by Sephadex LH-20 (CHCl3-MeOH, 2:1) to give compound 6 (9 mg). The residues from Fr. 8 (2 g) was separated by silica gel chromatography (petroleum ether-acetone, 5:1–2:1) to obtain 5 subfractions. Subfracton 8-2 (100 mg) yielded crystals that were recrystallized from MeOH to give compound 7 (18 mg); Subfraction 8-4/8-5 (250 mg) was separated by silica gel chromatography (cyclohexane-EtOAc, 3:1); and purified on Sephadex LH-20 (CHCl3-MeOH, 2:1) to get compound 8 (17 mg). The theoretical ECD spectra calculation of compound 5 was performed using Gaussian Program by Yunnan Electronic Computing Center. The possible geometries were previously optimized by density functional theory (DFT) method at the B3 LYP/6-31G (d, p) level. Excitation energies and rotational strengths were calculated using time-dependent DFT at the B3 LYP/6-31 G (d, p) level in methanol with polarizable continuum model. The calculated ECD spectrum was generated using SpecDis in the end. Mixture of compounds 1 and 2: White amorphous powder. NMR spectra data for compound 1: 1H NMR (600 MHz, CDCl3): δH 5.24 (1H, br s, H-12), 3.13 (1H, m, H-3), 1.15, 1.14, 0.98, 0.89, 0.84, 0.80, 0.78 (each 3H, s, 7×CH3); 13C NMR (150 MHz, CDCl3): 183.2 (C-28), 143.4 (C-13), 122.3 (C-12), 78.3 (C-3), 55.0 (C-5), 47.5 (C-9), 46.2 (C-17), 45.5 (C19), 41.3 (C-14), 40.5 (C-18), 39.5 (C-8), 38.6 (C-1), 38.6 (C-4), 37.0 (C-10), 33.6 (C-21), 33.0 (C-29), 32.5 (C-7), 32.4 (C-22), 30.5 (C-20), 28.0 (C-23), 27.8 (C-15), 27.3 (C-2), 26.0 (C-27), 23.6 (C-30), 23.3 (C-16), 22.7 (C-11), 18.2 (C-6), 17.2 (C-26), 15.5 (C-24), and 15.2 (C-25). NMR spectra data for compound 2: 1H NMR (600 MHz, CDCl3): δH 5.23 (1H, br s, H-12), 3.14 (1H, m, H-3), 1.12, 0.98, 0.84, 0.82, 0.74 (each 3H, s, 5×CH3), 0.91 (3H, d, J = 6.4 Hz, CH3), 0.83 (3H, d, J = 6.2 Hz, CH3); 13C NMR (150 MHz, CDCl3): 180.2 (C-28), 137.8 (C-13), 125.0 (C-12), 78.3 (C-3), 55.0 (C-5), 52.9 (C-18), 48.1 (C-9), 47.0 (C-17), 41.3 (C-14), 39.3 (C-8), 38.9 (C-4), 38.6 (C-19), 38.4 (C-1), 38.4 (C-20), 37.5 (C-10), 36.6 (C-22), 33.0 (C-7), 30.5 (C-21), 27.8 (C-2), 27.6 (C-15), 27.5 (C-23), 23.2 (C-27), 23.0 (C-11), 20.8 (C-30), 18.0 (C-6), 17.9 (C-16), 16.7 (C-26), 16.4 (C-29), 15.5 (C-24), and 15.0 (C-25). The mixture of compounds 1 and 2 was compared with standard samples (oleanolic acid and ursolic acid) using special TLC method. The plate with sample dots was fumigated by iodine steam first, and then developed by mixture solvents of cyclohexane-acetone-EtOAc-formic acid (8:2:1:0.2). After spray sulfuric acid-EtOH (10%) and heated, the plate can show the clearly separated sample dots of oleanolic acid and ursolic acid. The TLC comparison, together with the comparison of NMR data with those reported in literature, confirmed that the mixture were oleanolic acid and ursolic acid. Compound 3: Colorless gum. 1H NMR (400 MHz, CDCl3): δH 7.14 (1H, m, H-2), 5.73 (1H, m, H-7), 5.68 (1H, m, H-6), 4.76 (2H, m, H-1), 2.97 (2H, m, H-5), 1.28 (6H, s, CH3-9 and CH3-10). 13C NMR (100 MHz, CDCl3): dC 174.1 (C-4), 145.3 (C-2), 141.2 (C-7), 132.8 (C-3), 121.2 (C-6), 70.4 (C-8), 70.3 (C-1), 29.6 (C-9), 29.6 (C-10), and 28.0 (C-5). Compared NMR data of 3 with those reported in literature, compound 3 was identified as sibiscolacton. Compound 4: Colorless oil. 1H NMR (600 MHz, CDCl3): δH 4.20 (1H, dd, J = 11.6, 4.5 Hz, Ha-1), 4.15 (1H, dd, J = 11.6, 6.1 Hz, Hb-1), 3.93 (1H, m, H-2), 3.70 (1H, dd, J = 11.4, 3.9 Hz, Ha-3), 3.60 (1H, dd, J = 11.4, 5.8 Hz, Hb-3), 2.35 (2H, t, J = 7.6 Hz, H-2'), 1.63 (2H, m, H-3'), 1.28 (24H, m, H-4'~H-15'), and 0.88 (3H, t, J = 6.8 Hz, H-16'). NMR data comparison of 4 with those reported in literature, together with the comparison between 4 and standard in three different developing solvents (cyclohexane-acetone, 5:4; cyclohexane-EtOAc, 1:1.5; and CHCl3-acetone, 4:1), confirmed that compound 4 was monopalmitin. Compound 5: Colorless gum. (c 0.001, CHCl3). 1H NMR (600 MHz, CDCl3): δH 5.51 (1H, t, J = 6.5 Hz, H-2), 4.19 (2H, d, J = 6.8 Hz, H-1), 3.81 (1H, m, H-5), 2.20 (1H, dd, J = 13.5, 3.1 Hz, Ha-4), 2.06 (1H, dd, J = 13.5, 9.2 Hz, Hb-4), 1.80 (1H, m, H-7), 1.72 (3H, s, CH3-10), 1.42 (1H, ddd, J = 13.9, 8.7, 5.5 Hz, Ha-6), 1.22 (1H, ddd, J = 13.3, 8.3, 4.1 Hz, Hb-6), 0.92 and 0.92 (each 3H, d, J = 6.4 Hz, CH3-8 and CH3-9). 13C NMR (150 MHz, CDCl3): δC 136.2 (C-3), 126.5 (C-2), 66.6 (C-5), 58.9 (C-1), 48.0 (C-4), 46.2 (C-6), 24.4 (C-7), 23.1 and 21.8 (C-8 and C-9), 16.1 (C-10). Compared NMR data with those reported in literature,,, 5 was identified to be dihydroneroloxide, but no absolute configuration was given in these literatures. To assign the absolute configuration, the ECD data of two possible isomers were calculated and compared with experimental spectrum. The results showed that the theoretical ECD data for (5S)-isomer was in good agreement with the experimental spectrum [Figure 2]. Thus, the structure of 5 was established as (5S)-dihydroneroloxide. Compound 6: Colorless needle crystal. Melting point 169°C–172°C. 1H NMR (600 MHz, CDCl3+ CD3 OD): δH 7.56 (1H, d, J = 15.8 Hz, H-7), 7.08 (1H, d, J = 1.8 Hz, H-2), 7.02 (1H, dd, J = 8.2, 1.6 Hz, H-6), 6.88 (1H, d, J = 8.2 Hz, H-5), 6.27 (1H, d, J = 15.7 Hz, H-8), and 3.90 (3H, s, OCH3). NMR data comparison of 6 with those reported in literature, together with the comparison between 5 and standard in three different developing solvents (cyclohexane-acetone, 2:1; cyclohexane-EtOAc, 1:1.5; and CHCl3-acetone, 4:1), confirmed that compound 6 was ferulic acid. Compound 7: White amorphous powder. Melting point 277°C–279°C. 1H NMR (600 MHz, CDCl3+ CD3 OD): δH 4.72 (1H, s, Ha-29), 4.59 (1H, s, Hb-29), 3.63 (1H, dt, J = 10.9, 4.3 Hz, H-2), 3.01 (1H, m, H-19), 2.92 (1H, d, J = 9.6 Hz, H-3), 2.26 (1H, m, H-13), 1.69, 1.00, 0.99, 0.95, 0.90, 0.78 (each 3H, s, 6×CH3); 13C NMR (150 MHz, CDCl3+ CD3 OD): 179.6 (C-28), 151.2 (C-20), 109.9 (C-29), 83.9 (C-3), 69.2 (C-2), 56.8 (C-17), 56.1 (C-5), 51.2 (C-9), 49.8 (C-18), 47.7 (C-1), 47.4 (C-19), 43.0 (C-14), 41.3 (C-8), 39.9 (C-4), 38.9 (C-10), 38.9 (C-13), 37.6 (C-22), 34.8 (C-7), 32.8 (C-16), 31.1 (C-21), 30.2 (C-15), 28.8 (C-23), 26.1 (C-12), 21.6 (C-11), 19.5 (C-30), 18.9 (C-6), 17.6 (C-25), 16.9 (C-24), 16.3 (C-26), and 14.9 (C-27). Compared NMR data of 7 with those reported in literature,, compound 7 was identified as alphitolic acid. Compound 8: White amorphous powder. Melting point 145°C–147°C. 1H NMR (600 MHz, CDCl3+ CD3 OD): δH 7.55 (1H, d, J = 15.9 Hz, H-7), 7.05 (1H, d, J = 1.7 Hz, H-2), 6.93 (1H, dd, J = 8.1, 1.8 Hz, H-6), 6.81 (1H, d, J = 8.1 Hz, H-5), 6.23 (1H, d, J = 15.9 Hz, H-8), 4.23 (2H, q, J = 7.1 Hz,-OCH2 CH3), and 1.33 (3H, t, J = 7.1 Hz,-OCH2CH3). NMR data comparison of 8 with those reported in literature, together with the comparison between 5 and standard in three different developing solvents (cyclohexane-acetone, 1.5:1; cyclohexane-EtOAc, 6:5; and CHCl3-acetone, 4:1), confirmed that compound 8 was ethyl caffeate. The leaves and swigs of S. angustata were popularly used by Tibetans of Hengduan Mountains for their benefit of health, and such traditional application awakened our research interest. Phytochemical research on medicinal plant will be helpful in clarifying its active ingredients. Our investigation has led to the isolation of 8 known compounds, including 2 monoterpenoids and 3 triterpenoids, and 4 of them were isolated from this plant for the first time. Previous studies indicated that monoterpenoids and their glycosides were the characteristic components of this plant, and some of them showed hypolipidemic and anti-obesity activities,,, which may be responsible for its pharmacological effects. In this study, we also isolated two monoterpenoids, among which one was newly isolated, and such results further enriched the chemical constituents of S. angustata. This work was financially supported by the Fundamental Research Funds for the Central Universities (ZYGX2016J120). The authors thanked Dr. Jian-Wei Dong, School of Chemical Science and Technology, Yunnan University, for his kind help in ECD calculation. This work was financially supported by the Fundamental Research Funds for the Central Universities (ZYGX2016J120). Yu DJ. Editorial Committee of Flora of China. Flora Republicae Popularis Sinicae. Vol. 36. Beijing: Science Press; 1974. p. 70. Wang X, Guo J, Yang B. Studies on narrowleaf Sibiraea (Sibiraea angustata) in regulating lipoid metabolism. Chin Tradit Herbal Drugs 1995;26:473-5. Zhang CZ, Feng SL, Li C, Zhao CX, Shang XY, Ma HP. Triterpenoids constituents from Tibetan medicine Liucha (Sibiraea angustata). China J Chin Mater Med 1992;17:360, 373. Liu J, Wu S, Wei X, Yang R. Studies on the chemical constituents of Sibiraea angustata. J Trop Subtrop Bot 1999;7:248-51. Tao TT, Sei Y, Wang TZ, Bai C, Chang YB. Chemical constituents of Sibiraea angustata. Chin J Nat Med 2006;4:257-9. Ito Y, Kamo S, Sadhu SK, Ohtsuki T, Ishibashi M, Kano Y, et al. Structure of new monoterpene glycoside from Sibiraea angustata RCHD. and its anti-obestic effect. Chem Pharm Bull (Tokyo) 2009;57:294-7. Li B, Lee JB, Hayashi K, Ito Y, Sun WJ, Wang X, et al. Two new monoterpenes from Sibiraea angustata. J Nat Med 2010;64:89-92. Wang ZW, Li B, Yu SS, Lai XW, Liu B, Hayashi T, et al. Eight new monoterpene acylglucosides from Sibiraea angustata. Phytochem Lett 2013;6:461-6. Li B, Chen X, Wang Z, Liu H, Liu B, Yu S, et al. Two new monoterpenes and one dicaffeic acid ester from Sibiraea angustata with hypolipidemic activities in HepG2 cells in vitro. Phytochem Lett 2015;13:319-23. Yao Z, Liu H, Xu X, Chen X, Zhang D, Lai X, et al. Three new monoterpene glucosides from Sibiraea angustata. Nat Prod Res 2016;30:2453-9. Xie G, Wang X, Kurtán T, Mändi A, Wang T. Sibiralactone: A new monoterpene from Sibiraea angustata. Nat Prod Commun 2011;6:1799-800. Dong JW, Cai L, Li XJ, Peng L, Xing Y, Mei RF, et al. Two new peroxy fatty acids with antibacterial activity from Ophioglossum thermale kom. Fitoterapia 2016;109:212-6. Liao Y, Liu X, Yang J, Lao YZ, Yang XW, Li XN, et al. Hypersubones A and B, new polycyclic acylphloroglucinols with intriguing adamantane type cores from Hypericum subsessile. Org Lett 2015;17:1172-5. Allard PM, Martin MT, Dau ME, Leyssen P, Guéritte F, Litaudon M, et al. Trigocherrin A, the first natural chlorinated daphnane diterpene orthoester from Trigonostemon cherrieri. Org Lett 2012;14:342-5. Cheng JJ, Xie XM, Zhang SL, Ge XJ, Huang LD. 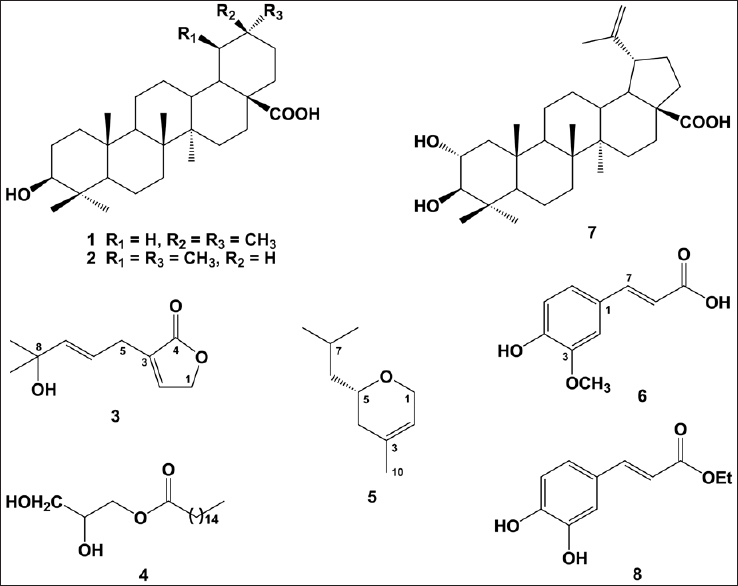 Identification of triterpene acids including oleanolic acid and ursolic acid in Fructus chaenomelis by thin-layer chromatography. J Anhui Tradit Chin Med Coll 2012;31:68-70. Ju JH, Zhou L, Lin G, Liu D, Wang LW, Yang JS. Studies on constituents of triterpene acids from Eriobotrya japonica and their anti-inflammatory and antitussive effects. Chin Pharm J 2003;38:752-7. Yang X, Lei H, Fu H, Ma G, Lin W. Chemical constituents from the seeds of Koelreuteria paniculata Laxm. Acta Pharm Sin 2000;35:279-83. Kitahara T, Takagi Y, Matsui M. Structure and the synthesis of novel constituents of yudzu peel oil and their conversion to related monoterpenes. Agric Biol Chem 1980;44:897-901. Snider BB, Rodini DJ, Kirk TC, Cordova R. Dimethylaluminum chloride catalyzed ene reactions of aldehydes. J Am Chem Soc 1982;104:555-63. More GP, Rane M, Bhat SV. Efficient Prins cyclization in environmentally benign method using ion resin catalyst. Green Chem Lett Rev 2012;5:13-7. Yi JH, Chen Y, Li BG, Zhang GL. Studies on the chemical constituents of the tubers of Curcuma longa. Nat Prod Res Dev 2003;15:98-100. Suksamrarn S, Panseeta P, Kunchanawatta S, Distaporn T, Ruktasing S, Suksamrarn A, et al. Ceanothane- and lupane-type triterpenes with antiplasmodial and antimycobacterial activities from Ziziphus cambodiana. Chem Pharm Bull (Tokyo) 2006;54:535-7. Wang DW, Luo XD, Jiang B. Chemical constituents in twigs and leaves of Melodinus fusiformis. Chin Tradit Herbal Drugs 2012;43:653-7. Liang YH, Ye M, Zhang LZ, Li HF, Han J, Wang BR, et al. Two new phenolic acids from Drynariae Rhizoma. Yao Xue Xue Bao 2010;45:874-8.